Five confirmed dead, 40 injured in the terror attack near the Houses of Parliament. 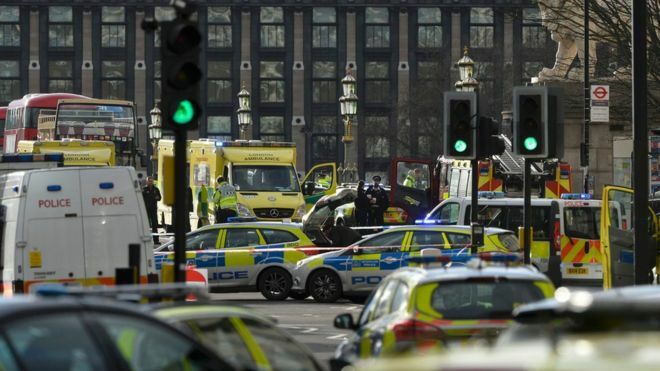 At 14.40 GMT a single attacker drove a car over Westminster Bridge, near the Houses of Parliament in central London, killing two pedestrians and injuring many more. The car then crashed into railings outside the Houses of Parliament. The attacker, armed with a knife, ran to Parliament where he was confronted by the police. One officer - who was not armed - was stabbed and killed. The attacker was shot dead by armed officers. The five who died included the attacker, the police officer and two people who were on the bridge. The injured included three police officers who were walking across the bridge on their way back from a commendation ceremony. A group of French schoolchildren were also on the bridge and three were injured in the incident. Four university students from Edge Hill University, in Lancashire, were also injured in the attack. Two were sent to hospital as "walking wounded", whilst two others had minor injuries. London Ambulance Service said it had treated 12 people with serious injuries, who were all taken to hospital. They also treated eight people with less serious injuries at the scene. Kings College Hospital says eight patients were being treated there - six male, and two female. Two were described as critical and two stable St Thomas' Hospital said two patients had been admitted - both were stable. The attacker has not yet been identified. The prime minister said on Wednesday evening that there was a "single attacker". Parliament was suspended and politicians, journalists and visitors to the buildings were locked in for about five hours. Hundreds of people were evacuated from Parliament to Westminster Abbey for safety. Both the House of Commons and the House of Lords will sit on Thursday at their normal times. Police and the London mayor said there would be more unarmed and armed police officers on the streets in following days. The UK's threat level has been set at "severe" - meaning an attack is highly likely - for some time and this would not change, the prime minister said.